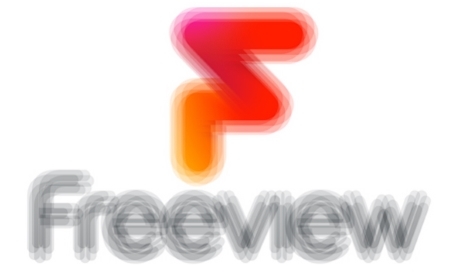 Over the next three years, Freeview is shuffling the frequencies it uses to make room for more mobile broadband. Will this mean risking missing a few TV shows? If you enjoy watching TV using Freeview, this means that there is a wire going from the back of your TV set to an aerial on the roof of your home, flat or office. In the air. 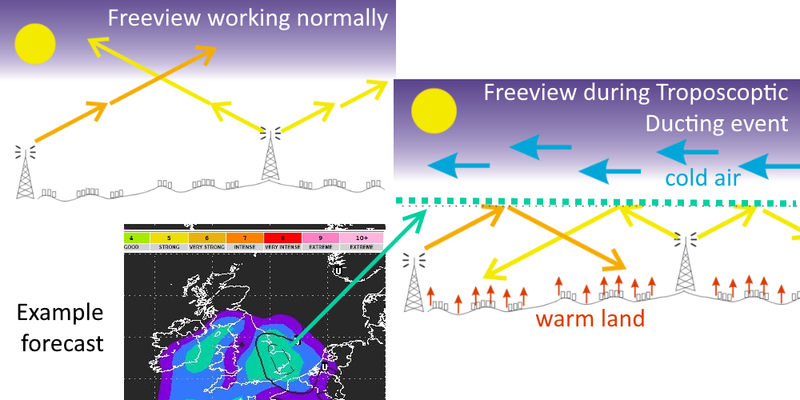 the Freeview TV signals travel in straight lines, like light, so the aerial needs to be able to “see” the top of a Freeview transmitter tower. Sometimes to synchronise a signal in a single frequency network area. It is quite reasonable to think that all the above conditions would remain constant over time. It was discovered that all TV signals sent horizontally do not always just zoom off into space. From time to time, changes to air pressure cause “Inversion” and the signals can reflect down as if there were a mirror at cloud level. Sometimes the signals can be found 800 miles beyond their expected locations. The way the digital TV signals are encoded incorporates ways to reject these unplanned, unexpected interference. There is a limit to what can be done in all instances. This means that moving a few streets away can make the difference between no Freeview at these times and normal service during a time of Tropospheric Ducting. People who watch satellite TV can have a similar, random problem caused by heavy rain and snowfall. Generally, these Tropospheric Ducting events happen in the UK about the times the clocks go forward and go back, and sometimes when there is a very still, cold winter. In simple terms the 700MHz changes will reduce the number of transmission frequencies for Freeview from 40 (C21 to C37, C39 to C48) to just 30 (C21 to C48, C55 and C56). This is being done in a way that keeps all the channels you can watch. It does mean, however, that during those times of random Tropospheric Ducting it will be slightly more likely that an interfering signal might occur at any given location. So, please don’t blame Freeview. They are pumping out all the usual signals if this happens to you. If it does happen, please don’t retune your equipment. It is unlikely that the problem will continue for more than a few hours at the most, and you will most likely be able to watch most other Freeview channels. Do we need an “Inversion Effect” predictor? Would it be useful to develop a tool to work out how bad a potential Tropospheric Ducting event might be for a given location? Crystal Palace is my nearest transmitter (18kilometres away; aerial group AH.TH) and according to my equipment the quality of the signal is good but the strength of the signal usually hovers around 47%. Previously the quality has been over 80%. I have had the same aerial since pre-Freeview/digital and never had problems before. Sorry, meant to say the strength of the signal hovered around 80% previously. Quality has always been good. Since there were several frequency changes earlier this year, you now need a wideband aerial and a Group A rtype is unsuitable. There has been no change to the power output from the transmitters so you may have a problem with the connections between your aerial and the TV set. Check each cable for damage and/or water ingress. Check each connections to ensure the contacts are clean and that no braid from the outer is touching the inner core. If there are coaxial plugs and sockets, unplug them and refit them to make sure the contacts are clean and fitting properly. Your= should aim to have signal strengths of between 60% and 85% to ensure there is sufficient signal for the tuner to use but not so much that it gets overloaded. Signal quality is less important and will be variable. Bear in mind also that the current spell of warm weather causes natural effects that make some signal reception problematic. When the weather patterns change those effects will usually disappear. DO NOT RETUNE your equipment. Why are there no problems at all on BBC channels? Just curious. Some people do experience problems with some or all channels. The BBC services are no more imune to some reception problems that those from other broadcasters. Most reception problems appear to centre around poor aerial systems that have developed faults, often being the corrosion of the contacts within coaxial plugs and sockets. That has been a bug-bear for service engineers for many, many years. The transmitters used are not really any different between and of the multiplexes (the grouped channels transmitted on a single frequency), and they carry services from a number of different providers in many cases. Occasionally a fault occurs within a transmitter, but that is actually very uncommon. All the transmitters are operated by Arqiva and they try to maintain all of them working as reliably as possible, irrespective of which programmes are being transmitted. All problems miraculously resolved on Saturday 21st. Presumably some drastic changes in atmospheric pressure! It's not so much the pressure but the weather pattern. That has changed, as it always will, and because it is now not creating inversion layers in your general area there are fewer problems, but other may now be gtting them. The weather effect has always been thus.